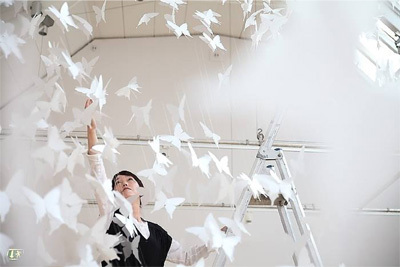 Nao Kimura has been creating a series of installations,"Metamorphosis" since 2009. The oriental idea in the base of her work that captures all things as one asks you a profound question. It is because she is seeing those countless butterflies as intermediate beings that go back and forth between two worlds of life and death, the conscious and the unconscious, the dream and the reality, as well as symbols for transform. She sees butterflies as a metaphor of our own existence. What she expresses with butterflies is unconscious inner space we are not aware of in our daily life. Through her work, we can be connected to another world.